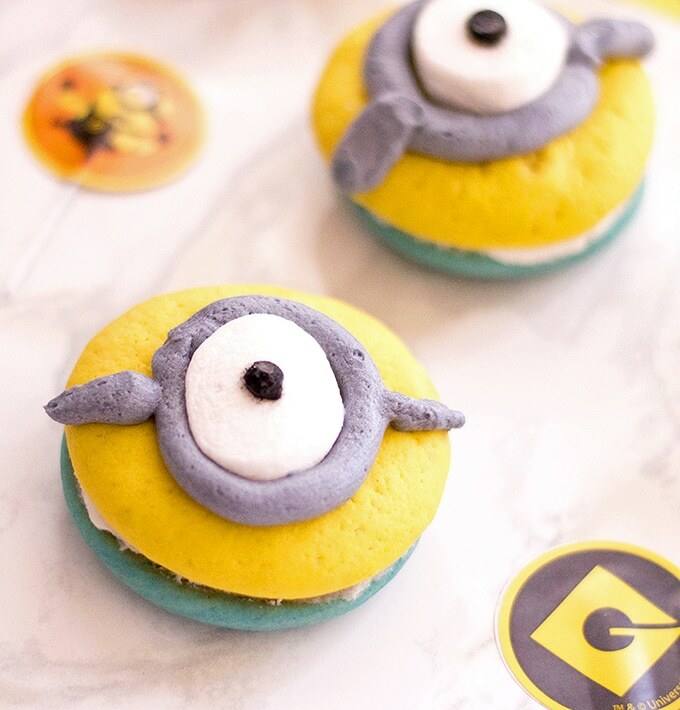 Minion Whoopie Pies are the most adorable sweet treat EVER! Fun to eat as they are to make, kids and adults alike will love these. 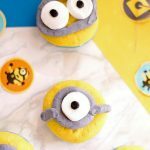 Perfect as an after-school snack or for a Minion birthday party! 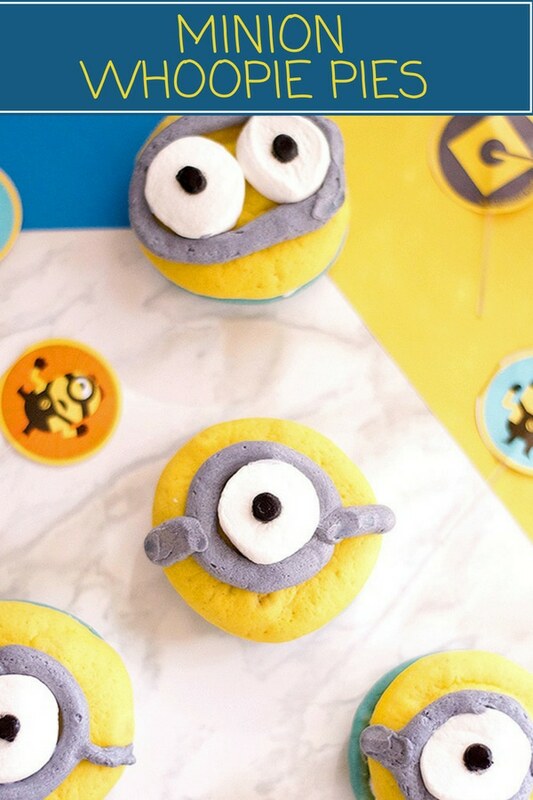 Guys, I am going to interrupt our regular savory programming and present to you these Minion whoopie pies. Aren’t they the cutest? I am seriously cracking up just looking at the photos. Minions my favorite cartoon character EVER (raise your ✋ if you still watch cartoons)! They’re cool and sassy and pesky but with a wide-eyed wonder and endearing innocence of a child. They definitely stole the show from Gru. 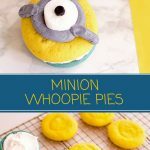 If you’re looking for a fun baking project to do with the kiddos, these whoopie pies are as a much fun to make as they are to eat. They’ll have a blast decorating and putting them together! Make a big batch; kids and adults alike will love receiving them as a special treat! With soft, fluffy cakes filled with perfectly sweetened buttercream, they’re as delicious as they are adorable. Make the whoopie pie batter following the recipe below. 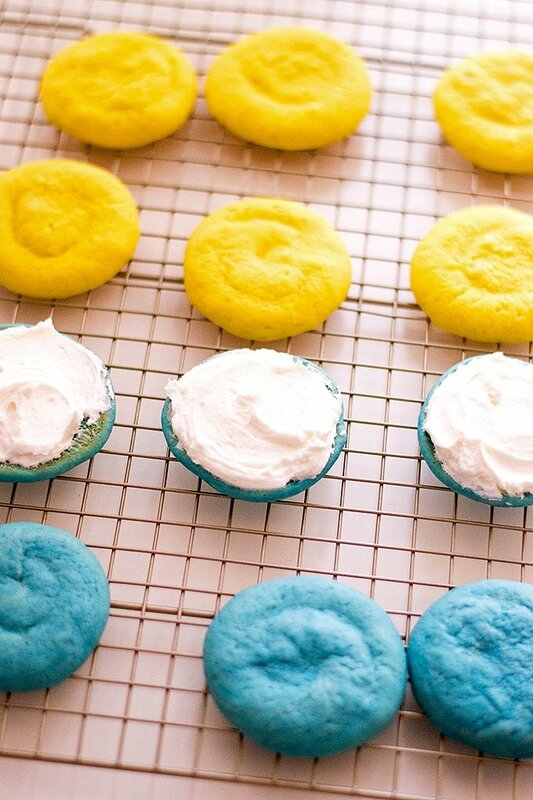 Tint half the number of whoopie cakes with blue gel coloring and the other half with yellow gel food coloring. 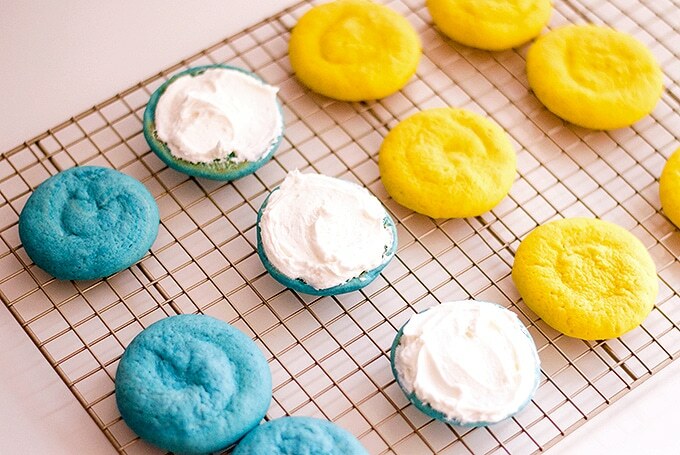 Place each colored batter in individual frosting bags. 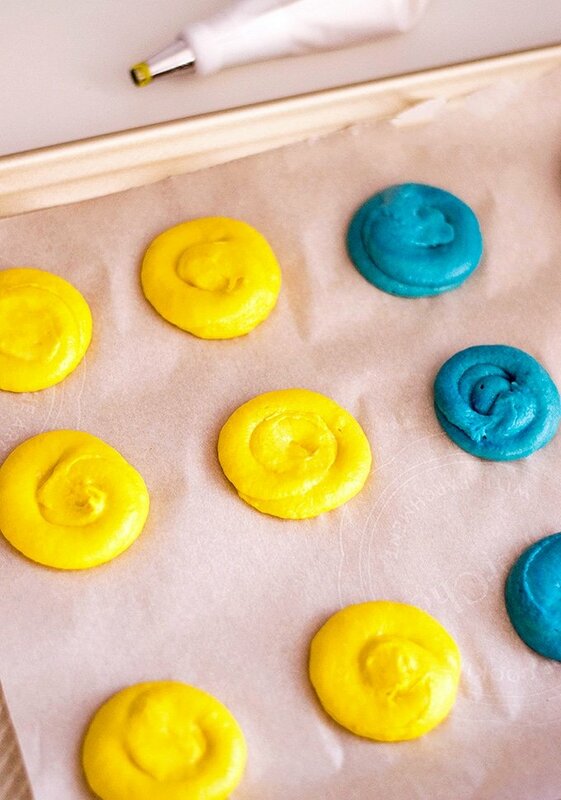 Pipe each colored batter onto a lined baking sheet at about 2 inches in diameter. Assemble by spreading the buttercream on the bottom of one blue cake. Sandwich the buttercream by placing a yellow cake on top. Place a marshmallow half (or two, depending on which Minions face you’d like – some have one eye and others have two!) in the middle of the whoopie pie. Use the buttercream to glue on. 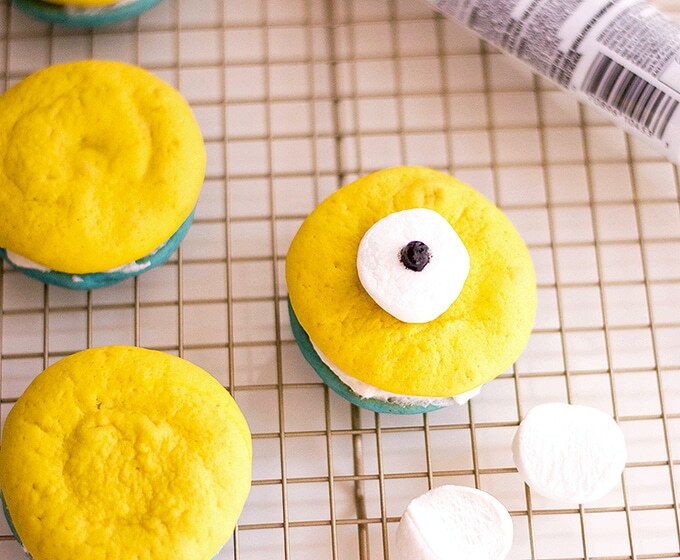 With the black frosting, draw irises on the marshmallow eyes. Use the grey buttercream to frost “goggles” around their eyes. Enjoyed these Minion-inspired whoopie pies? 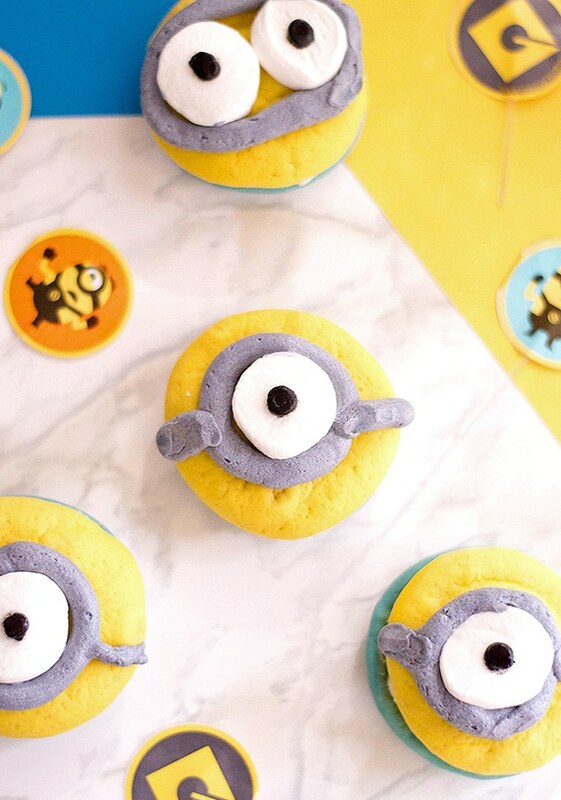 Stay tuned for the Minion cupcakes coming up soon! 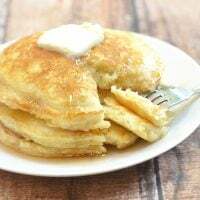 Using an electric mixer at medium speed, beat the butter, sugar, egg, and vanilla extract. Gradually increase speed to high and continue beating until mixture is creamy. 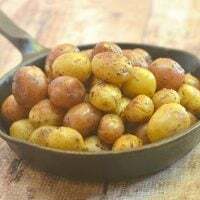 In a medium-sized bowl, sift together the flour, baking soda, and salt. Add the flour mixture to the egg mixture in thirds, alternating with the buttermilk. 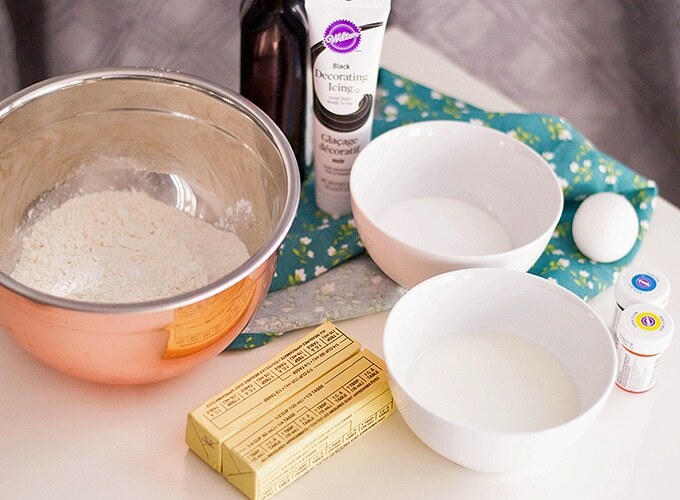 When thoroughly combined, divide the batter into two bowls. Color half of the batter with blue gel food coloring and the other half will be colored with yellow gel food coloring. 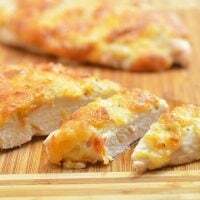 Bake in a preheated oven for about 10 to 12 minutes. Remove from oven and transfer on a wire rack to cool. 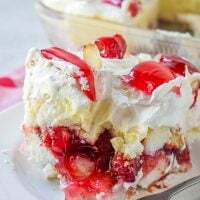 To prepare the filling, combine butter, sugar, and milk in a bowl. Beat on high speed until thoroughly combined and forms stiff peaks. To make the decorating buttercream, combine butter, sugar, milk, and vanilla extract in a bowl. Beat on medium speed, then gradually increase to high speed and continue to beat until mixture forms stiff peaks. Add black gel food coloring to buttercream and mix until evenly colored light grey. To assemble the whoopie pies, spread the filling on the bottom of one blue cake. Place a yellow cake on top of the buttercream to form a sandwich. Place a marshmallow half (or two, depending on which Minions face you’d like – some have one eye and others have two!) in the middle of the whoopie pie. Use the grey buttercream to glue on. Using the black frosting, draw irises on the marshmallow eyes. 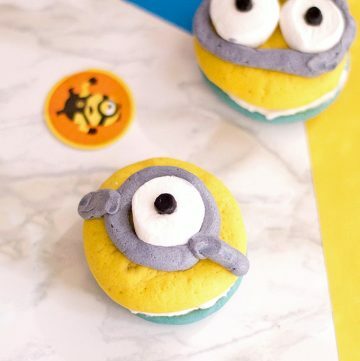 Use the grey buttercream to frost “goggles” around the eyes. The recipe will yield about 8 to 10 whoopie pies depending on size.